A dusty light filters through bamboo slats into the burial chamber. Rows of ancient figures stand guard down the length of the pit, shoulder to shoulder and back to front, perfect posture after 2,000 years of practice. The uncovered tomb sends cool air swirling up from the greenish clay bodies, mingling with the mutterings of the crowd. This is an eerie place to feel kinship. But as my dilated pupils scan the grave, a face separates itself from the soldiers and moves towards me. The dreamlike question precipitates out of the air between us—Reed? 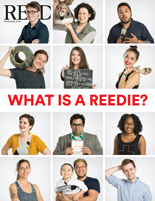 Amy Egerton-Wiley ’13 was in my year at Reed. As we traced our paths from Reed to Xi’an, I laughed at the Seussian twists and turns we had taken. Like me, she studied Mandarin with Prof. Hyong Rhew [1988–], inspired by his passion for the language and culture. Like me, she was drawn to China after graduation, searching for a new and invigorating intellectual adventure. Excited to have found an equally curious travel buddy, we pressed forward along the rails, peering down intently at the terra-cotta faces, searching for recognition. 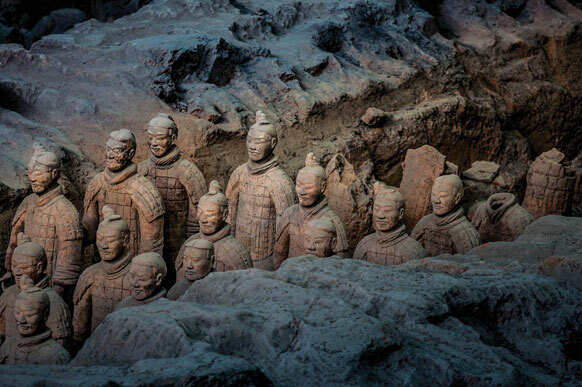 The Terra Cotta Warriors and Horses were built piecemeal over the course of 28 years, a legion of faithful soldiers ordered to protect Emperor Qin Shi Huang in the afterlife. Qin was wise to be wary of enemies even in death: although he brilliantly created a uniform system of weights and measures and united China under a standardized script, he was a bloody and ruthless leader. He modeled his massive underground city after his real-world kingdom, complete with mountains and valleys and rivers of mercury. With the necropolis complete, Qin had the builders killed and buried in mass graves. The intervening decades crushed the subterranean kingdom with layers of villages and earth, and the warriors slept until the 1970s. Since then, over 8,000 figures have been resurrected, shards and fragments snatched from the dirt and painstakingly glued back together. Foot soldiers and archers and cavalrymen blur into a phalanx of topknots. I find myself straining towards the pit, counting them over and over in a hapless attempt at comprehension. I imagine mercury swirling up with the air, droplets from a hundred shimmering rivers coating the warriors in eternal death. Each warrior’s face is distinct. Their youthful eyes and determined expressions are uncannily accurate, and I rack my memory for the face I am sure was the inspiration for a kneeling archer. Standing still against the press of visitors around us, we laughed at the overly poetic nature of our meeting. But when you’re in a massive necropolis designed by an egomaniac emperor, face-to-face with frozen soldiers, with mercury flowing underfoot, you can forgive an overdose of metaphor. We parted with the comfort of old friends. And I, at least, left with renewed courage and curiosity. Running into Reedies abroad creates cognitive dissonance, an unexpected space where we can examine what it is that drives and connects us. Meeting Amy in that tomb—one year into what was proving for me a difficult relocation—reminded me of all the people at Reed who challenged me to push my limits, to use curiosity as fuel for a lifelong journey. Reed taught me to relish debate and diversity of opinion, to find common ground in unlikely places, and to have the courage to ask tough questions. Reed creates a culture of boldness. The boldness to define the ideas and values you hold, and the integrity to pursue your truest self. So when you head out on adventures beyond Reed, be bold. Sometimes you find your truest self when you are face-to-face with a thousand unknown soldiers. —Author info: Haley Jacobson ’13 is exploring the wonders of Southeast Asia, leading experiential travel for high school students and spending hours staring open-mouthed at beautiful mountains and fields.